"What do you think of the theory that the "pillar of fire/cloud" in scripture is the pre-incarnate Christ? It's pretty widely accepted I've noticed." OUR RESPONSE: Thanks for the question! Of course there are many theophanies in the Tanach, and there are probably more arguments than Carter had liver pills as to which scriptures would be considered a pre-incarnate Christ and which are not. (Of course those in rabbinic Judaism would not believe any of them.) The only thing we can say for certain is that there are scriptures which address God appearing in some form, and since no one can see God and live (Exodus 33:20), this means that they really did not actually see God directly. Verses where Jacob, Abraham, Moses, and Isaiah— state that they saw God (Genesis 18:1; 32:30; Exodus 33:11; Isaiah 6:1) may seem contradictory but really are not. If God can be present (heard) in a burning bush, then God can be "seen" in human form without the person physically "seeing" God. (This is a concept Jews refuse. Since Christianity teaches that "Jesus is God", then it defeats the Jewish concept of monotheism, i.e., "one" God. So they have to refuse that Jesus is God. And they are somewhat correct.) Anyway, since God can't be seen directly, then yes, the pillar of fire/cloud in Exodus most certainly can be considered a view of the pre-incarnate Messiah. On the other hand, I think people miss the importance of the natural phenomena visible to anyone even today. I'm thinking of sun-pillars, sun dogs, glories, rainbows, halos, tangent arcs, etc. All these phenomena have sound, physical explanations but what is missed is that each one, every one of them are absolutely unique to the observer! The sight of any of these phenomena are unique to your own eyes. A rainbow, for example, seen in your eyes, is completely unique to you. If someone is standing next to you they see a completely different rainbow. Same rainbow from the same rain, yes, but the one seen is completely unique to each observer! 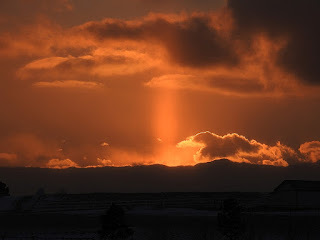 I see these atmospheric optical phenomena not for the underlying physics which explains them, rather, I see these things as a one-on-one communication - God directly to you. When one of these phenomenon is seen, the observer has had a completely private and unique conversation with God. And that, in my book makes them remarkable and I will not miss any chance to see and marvel at them. I am a gentile christian but I believe like you God is not a trinity but is one and jesus is the messiah sacrafice for our sins, and new adam but not god.good to see someone else sees in the bible what I do. Hello Anonymous, and thanks for your post. Two things: (1) As a Christian, you are no longer a "Gentile" but a "Hebrew" (which, in Hebrew, means "to cross over" - which is what Abraham the pagan Chaldean did, both physically and spiritually when he accepted YHWH as his God and thus became the first "Hebrew"). (2) Yes, our ELOHIM was never a "trinity"; however Yeshua was definitely Divine because he had a divine Nature. He is "one" with YHWH because he is the "arm of YHWH" (Isaiah 53:1), but he didn't come to replace YHWH as God. There is only ONE God and Yeshua is part of Him (Yeshua was the Word of YHWH, John 1:1, 14)...a human Messiah sent by YHWH to explain YHWH to the world and proclaim the Kingdom of God, and then to offer himself as the final SIN sacrifice, thus abolishing the need for men to kill innocent animals.